Have y’all heard that Miso Soup is a miracle soup? Really it is! Right now I have a bit of a cold, but a few days ago I had the grossest, nastiest head cold that you could imagine; I made myself a pot of Miracle Miso Soup, and the next day I felt eighty times better! Miso soup is made of miso paste, which is made of fermented soybeans and also seaweed; both of which offer tons of health benefits. Miso soup aids in digestion, which I didn’t really think too much about until I hit the age of…well we’ll just say I didn’t think about it in my twenties. It helps to strengthen the immune system to combat infection and lower the risks of certain cancer’s including prostate and breast cancer. 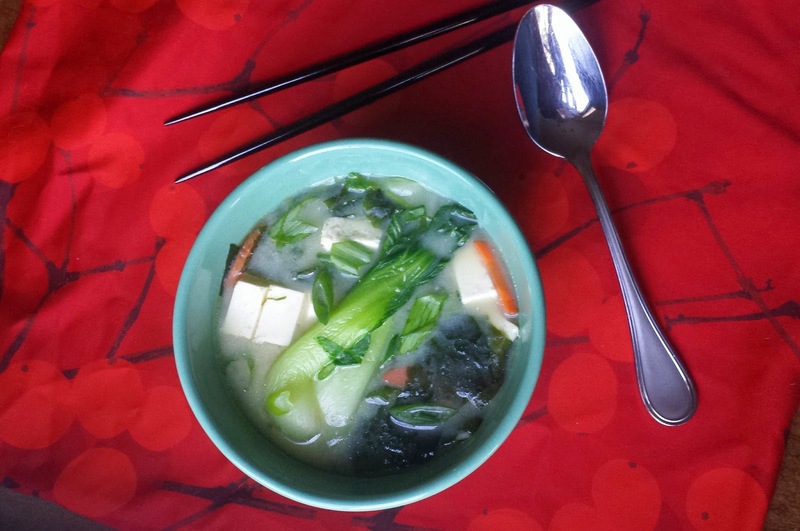 Drinking a couple of cups of miso soup a day also relieves the symptoms of menopause. I’m not there yet, but it’s something to consider! Miso soup is usually served just as a broth with bits of tofu and edible sea weed, but broth on its own is not filling. Miracle Miso Soup is vegetarian; you may use any miso paste that you like, I tried a low-sodium white miso paste this time, and I did miss the briny flavor that I’m used to, but it’s a good alternative if ya have to watch your salt intake. This soup has noodles and veggies added so that whether you’re feeling under the weather, or just want a good healthy meal, you can eat a bowl of this and feel totally satisfied. I wonder; if I’d been eating miso soup on a more regular basis if I even would have gotten this cold in the first place? Note to self: Eat more Miracle Miso Soup! In this recipe: miso paste, Kombu and Wakame sea vegetables, a carrot, baby bok choy, tofu, fine udon noodles, toasted sesame oil, and water. Place the Kombu in 4 ¼ cups of water, bring to a boil, turn the heat down to simmer for 4 minutes, and then discard the Kombu. Mean while; in a separate pan, cook the noodles according to the package directions. Being sure to separate the white part of the scallion from the dark green; as it will go into the soup at different times. Toss the cooked noodles with a few drops of toasted sesame oil and put to the side. The Wakame needs to soak for about 10 minutes in cold water. Once the Kombu has been removed, add the carrots and cook, simmering for 5 minutes. 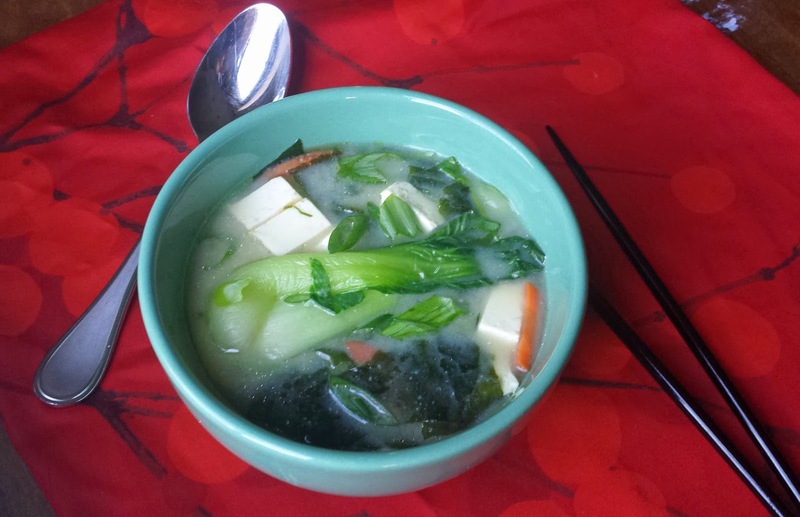 Then add the baby bok choy, tofu, soaked Wakame and the white part of the scallion. Simmer for 4 minutes longer. Whisk the miso paste with a little broth until smooth and then add it to the soup. Divide the noodles between two bowls, and ladle the soup over the noodles. Finally sprinkle the dark green part of the scallions over the soup. 1. Add the water and Kombu to a medium pan. Bring the water to a boil and then turn the heat down and allow the liquid to simmer for 4 minutes. Remove and discard the Kombu. 2. Meanwhile toss the cooked noodles with just a few drops of sesame oil and put to the side. 3. Add the Wakame to a small bowl and cover with cold water, allow to soak for about 10 minutes. 4. Add the carrots to the liquid and simmer for about 5 minutes. Add the baby bok choy, diced tofu, soaked Wakame, and the white part of the scallions; cook for about 4 minutes. In a small bowl whisk together the miso paste and some of the cooking liquid, until smooth, and then add it to the soup. 5. Divide the noodles between two bowls and then spoon the soup over them; finally sprinkle the dark green part of the scallion over the top and serve. I knew miso soup was healthy, but I had no clue it helped with menopause symptoms - my mom could certainly use some of this, lol! Looks divine as always, dear!